WASHINGTON (CNS) — The Supreme Court announced Nov. 2 that it would hear oral arguments this term to consider if a 40-foot cross in Maryland endorses religion or is simply a secular memorial. 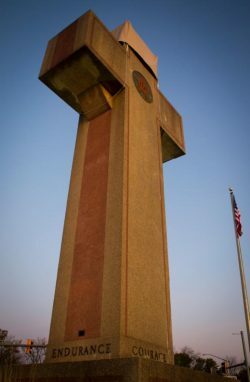 The cross in question sits at a busy intersection in the Washington suburb of Bladensburg, Maryland, and memorializes soldiers who died in World War I. Supporters of the Peace Cross stress that its message is secular: to commemorate war victims. They also have argued that the monument’s cross shape was not intended for religious reasons but to look similar to cross-shaped grave markers in Europe used for American soldiers who died there. This is not the first time the highest court has considered the status of religious monuments on public land. In 2005 it defended a Ten Commandments monument on the property of the Texas Capitol, noting that its religious message was part of a secular display. In 2009, the court ruled that it was constitutional for the federal government to permit a large cross to stay within the boundaries of a national preserve in the California desert, but because the case also involved the transfer of ownership of a small plot of federal land, the high court sent it back to lower courts for further consideration. In 2012, a federal judge approved a settlement on the transfer issue allowing the cross to remain. How the Supreme Court rules on this Peace Cross case could impact similar monuments, including crosses at Arlington National Cemetery, the military cemetery in Arlington, Virginia. Arguments in this case are expected before the end of the year.